Recombinant fragment within Human Doublecortin aa 250 to the C-terminus. The exact sequence is proprietary. WB: Human fetal brain and brain lysates; Mouse and rat brain lysates; SH-SY5Y whole cell lysate. IHC-P: Mouse and rat adult hippocampus tissues. IHC-Fr: Rat adult hippocampus tissue. ICC/IF: SH-SY5Y cells. Our Abpromise guarantee covers the use of ab222921 in the following tested applications. WB Use at an assay dependent concentration. Detects a band of approximately 40 kDa (predicted molecular weight: 40 kDa). Antigen retrieval: Heated citrate solution (10mM citrate PH 6.0 + 0.05% Tween-20). IHC image of Doublecortin staining in a formalin fixed, paraffin embedded normal rat hippocampus (SVZ region) tissue section, performed on a Leica Bond™ system using the standard protocol F. The section was pre-treated using heat mediated antigen retrieval with sodium citrate buffer (pH6, epitope retrieval solution 1) for 20 mins. The section was then incubated with ab207175 at 1/500 dilution for 15 mins at room temperature and detected using an HRP conjugated compact polymer system. DAB was used as the chromogen. The section was then counterstained with haematoxylin and mounted with DPX. 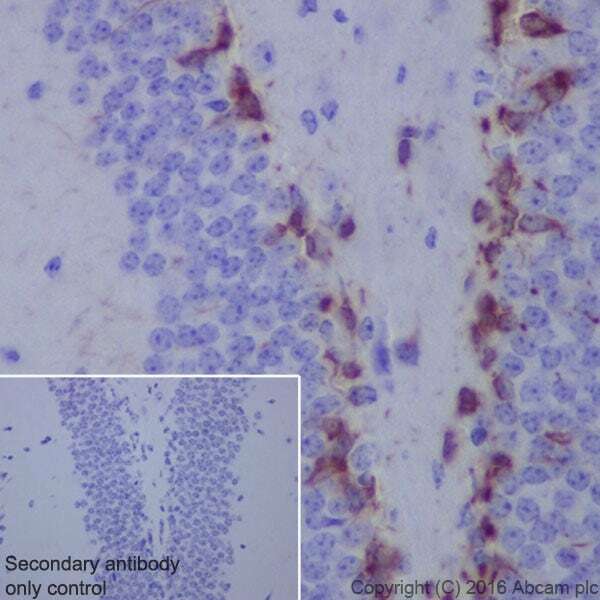 As a negative control (inset), an identical assay was performed without adding the primary antibody. 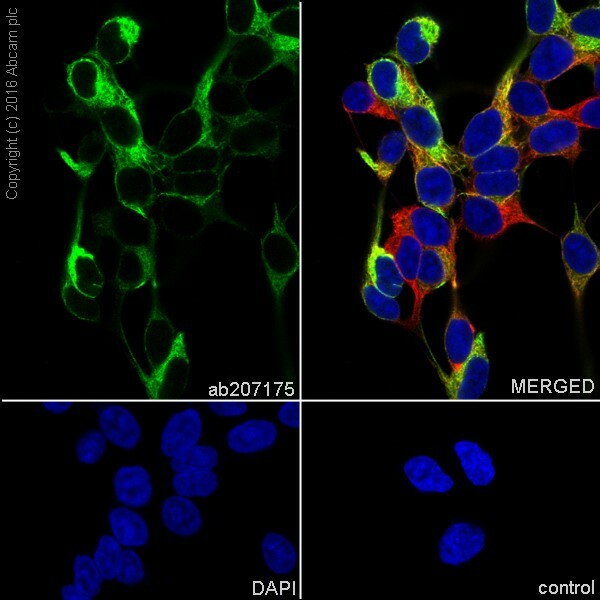 This data was developed using the same antibody clone in a different buffer formulation containing PBS, BSA, glycerol, and sodium azide (ab207175). Immunohistochemical analysis of paraffin-embedded mouse adult hippocampus tissue labeling Doublecortin with ab207175 at 1/250 dilution, followed by Goat Anti-Rabbit IgG H&L (HRP) (ab97051) at 1/500 dilution. Cytoplasmic staining on mouse hippocampal dentate gyrus is observed [PMID:23690918] [PMID:16814555]. Counter stained with Hematoxylin. Immunohistochemical analysis of paraffin-embedded rat adult hippocampus tissue labeling Doublecortin with ab207175 at 1/250 dilution, followed by Goat Anti-Rabbit IgG H&L (HRP) (ab97051) at 1/500 dilution. Cytoplasmic staining on rat hippocampal dentate gyrus is observed [PMID:23690918] [PMID:16814555]. Counter stained with Hematoxylin. Immunohistochemical analysis of 4% paraformaldehyde-fixed, 0.2% Triton X-100 permeabilized frozen rat adult hippocampus tissue labeling Doublecortin with ab207175 at 1/100 dilution, followed by Goat anti-rabbit IgG (Alexa Fluor® 488) (ab150077) secondary antibody at 1/1000 dilution (green). Cytoplasmic staining on rat hippocampal dentate gyrus is observed [PMID:23690918] [PMID:16814555]. The nuclear counterstain is DAPI (blue). Immunofluorescent analysis of 100% Methanol-fixed SH-SY5Y (Human neuroblastoma cell line from bone marrow) cells labeling Doublecortin with ab207175 at 1/250 dilution, followed by Goat anti-rabbit IgG (Alexa Fluor® 488) (ab150077) secondary antibody at 1/1000 dilution (green). Confocal image showing cytoplasmic staining on SH-SY5Y cell line. The nuclear counter stain is DAPI (blue). Tubulin is detected with ab195889 (Anti-alpha Tubulin antibody [DM1A] - Microtubule Marker (Alexa Fluor® 594)) at 1/200 dilution (red). ab222921 has not yet been referenced specifically in any publications. Publishing research using ab222921? Please let us know so that we can cite the reference in this datasheet. There are currently no Customer reviews or Questions for ab222921.